The oldest and most popular nightclub in the whole of Singapore is simply a must for any party animal. Even those who don’t frequent the dance floor as often as the regular party goer should check out this influential venue. Some of its best acts and events include cutting-edge electronic discos, international DJs and bi-monthly glow-in-the-dark parties. Besides the avant garde lounge areas, Zouk is characterised by its adrenaline-inducing neon and strobe lights, as well as its incredible 35,000 square feet of dance floor. 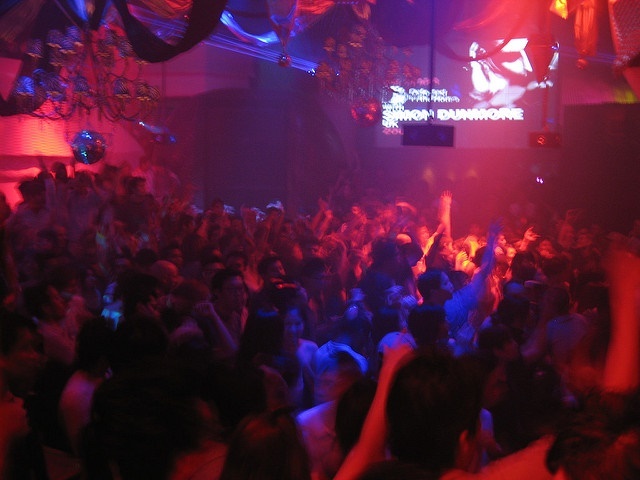 Whether you’re here for a drink or a rave, Zouk is the place to go. As one of the largest and most luxurious hotels in the entire world, it’s difficult to list all the wonders that can be experienced at Marina Bay Sands. Despite Singapore’s strict gambling laws, the Marina Sands Casino remains one of the most iconic gambling establishments in the world, and a venue for numerous international tournaments. Don’t worry if poker isn’t your thing – there’s plenty more to be experienced at this glitzy five-star resort, including a famous infinity pool, countless upscale fashion stores, Michelin star restaurants and pampering spas. The Marina Bay Sands towers over the bayfront, its many lights reflected in the Singapore River Bank. Whether you enter the resort or not, the sight of the structure’s exterior is impressive in itself. This one’s for the history buffs – and anyone else who wants to delve further into the intriguing past that has come to shape Singapore and other parts of Asia. A collection of art galleries, ancient artifacts and lectures make up the museum’s comprehensive exhibits; most of which are renowned across the whole of Asia for their invaluable historical significance. Indeed, this beautiful museum is known as one of the pioneering institutions to specialize in Asian history. If you’re ready for a full-on learning experience, be sure to visit this attraction. Get a ticket for the concert of a lifetime at the lavish Esplanade Theatre. 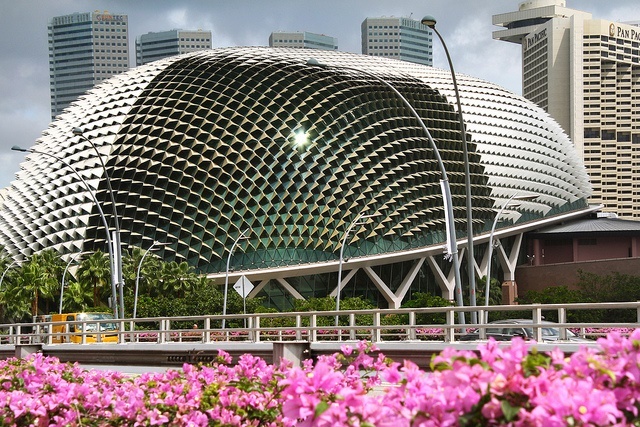 This performing arts centre, located on the Singapore River bay, is famed for its eye-catchingly unique architectural design (often said to resemble the pungent tropical fruit, ‘durian’) and its regular comparisons to the Sydney Opera House. Inside the complex you’ll find a 1,600-seat concert hall and 2,000-seat theatre – both of which put on only the most breath-taking of shows. As the second Universal Studios Park to open in Asia (the first was in Japan), this theme park is just a few years old but already a major attraction in Singapore. There are seven themed sections of the park – each one relating to a famous movie or Hollywood era. This means you can experience the dinosaurs of Jurassic Park, the lemurs of Madagascar and Shrek’s swamp – all in one day. On top of that, you can have your photo taken with stars such as Charlie Chaplin and Marilyn Monroe. 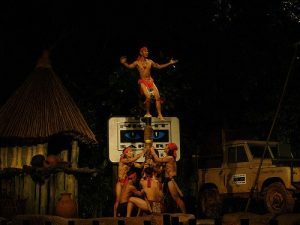 Rides and restaurants can get crowded, but Singapore’s one-of-a-kind Universal Studios park is well worth a visit for children and adults alike. 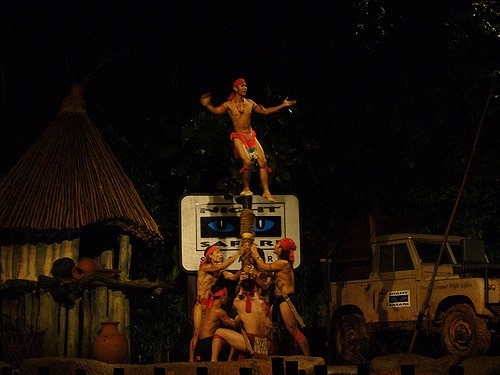 One of the most thrilling, educational and family-friendly attractions in all of Singapore; this wildlife and conservation park allows visitors to appreciate incredible wild animals during dark hours. Get up close to rhinoceros, jaguars, anteaters, tusked elephants, pythons and gazelles in an intimate safari experience – then finalize your evening with entertainment and thematic dining! 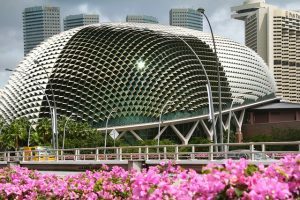 They don’t call Singapore the ‘Garden City’ for nothing, and the three contemporary waterfront parks that are collectively known as ‘Gardens by the Bay’ can only be described as Singapore’s crown jewel when it comes to flora and fauna. This enormous and colourful nature centre is filled with surreal ‘supertrees’, rare and exotic rainforest plants, seashell treehouses and long, winding skywalks. This is a stunningly beautiful place to visit whether you’re looking for a stroll along amongst trees, a picnic in the park – or if you’re just looking to soak up the futuristic atmosphere. Move aside, London Eye. 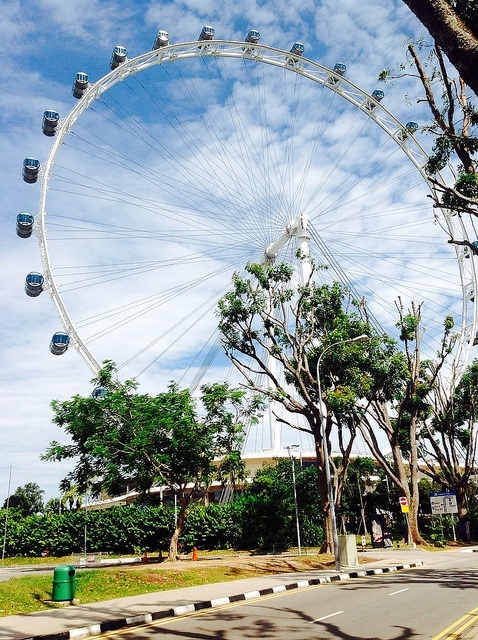 The Singapore Flyer is the largest observation wheel in the world, at 150 metres in diameter and 165 metres in height. There’s no better way to experience the sights of Singapore than in these spacious and panoramic capsules. 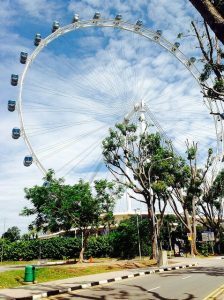 Notch up the incredible experience by opting for one of Singapore Flyer’s VIP capsules which allows you to enjoy fine dining, champagne and music during your time on the ferris wheel. Do you like coffee? Cake? Cuddly cats? If you answered yes to all (why wouldn’t you?) then you should grab a bite at one of Singapore’s many cat cafes. Amongst the most famous is ‘The Company of Cats’ located on Mosque Street in Chinatown. This adorable coffee house started out as a feline lovers club, where cat fanatics would get together for a chat and maybe some yoga. Now, ‘The Company of Cats’ is open to anyone who fancies curling up into an armchair with a book and fluffy cat. Every cat has been rescued from the streets, and their favourite part of the day is being shown affection by attentive customers!